A 737-900, VT-JGD, 33740/1350, operated by Jet Airways suffered a right main landing gear collapse shortly after landing at Mumbai on 3 March 2016 at 1622 UTC. The landing was carried out by Co-pilot & PIC was carrying out supervised line flying. The aircraft landed safely on Runway 27 and during landing roll, 16 seconds after touchdown, at speed 58 knots Right main landing gear aft trunnion pin broke and Right Main Landing Gear collapsed. The aircraft started deviating to the right of center line. Pilot tried to vacate runway via taxiway N9 using tiller but aircraft stopped on taxiway. There was damage to the RH landing gear and aircraft was resting on RH engine, Nose & LH landing Gear. Hydraulic fluid spillage occurred due to damage to RH main landing gear. Maximum G load recorded during landing was 1.44 G. ATC observed sparks between Taxiway N 7 and N 8 when engine cowl was rubbing runway and informed Fire Station and Apron control. The CFT reached the aircraft and sprayed the foam fire Extinguisher on the No. 2 Engine & RH Landing gear area on spilled Hydraulic Fluid to prevent fire. The passengers disembarked from L1 door using passenger stairs. After the accident, the failure investigation of Trunnion Pin was carried out at DGCA & NTSB, USA. The report reveals that that the RH trunnion pin failed due to base metal heat damage as a result of abusive grinding of the chrome plate that likely occurred during the last overhaul [this was done at at M/s ST Aerospace Solutions A/S, Oslo, Norway on 11-07-2013]. The fracture originated in an area of un-tempered martinsite on the outer diameter of the trunnion pin. The crack originated from intergranular separation, a result of hydrogen embrittlement during cadmium plate processing. The crack propagated by Transgranular fatigue mode with ductile separation at final fracture. Multiple cracks were found near the fracture origin. 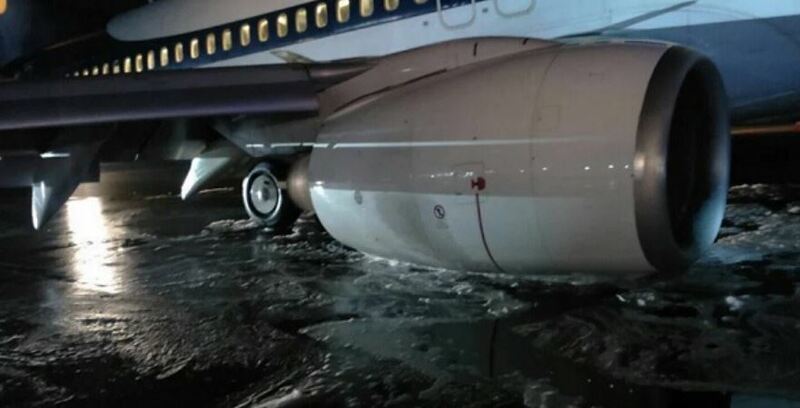 Jet Airways Boeing 737-900, VT-JGD while operating scheduled domestic passenger flight 9W-354 from Delhi to Mumbai with 120 passengers and 8 crew on 03-03-2016 was involved in an accident at Chhatrapati Shivaji International (CSI) Airport, Mumbai. The aircraft had safely landed on runway 27 at 16:22 UTC and was about to vacate the runway via taxiway N9 when the right main landing gear collapsed. The aircraft could not vacate the runway and became disabled on taxiway N9 with tail portion projecting on runway 27. Runway 09/27 was closed for flight operations while the aircraft was being removed. All air traffic used runway 14/32. The recovery work was completed by 0530 UTC on 04-03-2016 and the aircraft was towed to hanger. As per DFDR the “G” load during landing was 1.44 G. After 16 sec from touch down during landing roll, at 58 Kts, there was right roll of 4.57° and the aircraft veered to the right with a noise which felt like a tire burst to the cockpit crew. To maintain directional control first officer moved the tiller. The aircraft vacated by N9 taxiway and after vacation the aircraft stopped on its own on the taxiway with the tail of the aircraft not fully clear of runway 27. Flaps was moved to 40, in case if the situation warranted an evacuation. PIC contacted on VHF 2 to dispatch / maintrol of Jet Airways and the FO was monitoring VHF 1. Sequentially, APU was started and Engine No. 2 was shut down and later No. 1 engine. PIC advised the cabin crew not to DISARM the doors until advised. On arrival of passenger stairs at 1651 UTC, passengers safely disembarked through the L1 door and no emergency evacuation was carried out. As per ATC, sparks were observed from Right side landing gear when aircraft was moving on Runway 27 between Taxiway N 7 and N 8. ATC informed crew, Fire Station and Apron control. At 1627 UTC, the CFT sprayed foam type fire Extinguisher on the RH Engine area and also on spilled Hydraulic Fluid to prevent fire. Ministry of Civil Aviation vide order No. AV 15029/3/2016-DG constituted a committee of inquiry to investigate the accident under Rule 11 (1) of Aircraft (Investigation of Accidents and Incidents), Rules 2012. The committee includes Sh. Amit Gupta Deputy Director-AED as Chairman and Sh. Raje Bhatnagar, Assistant Director of Airworthiness, Ms. Shilpy Satiya, Air Safety Officer and Sh. Dinesh Kumar Air Safety Officer as members. The Committee of inquiry determined the cause of accident as “The RH Aft landing Gear trunnion pin failed due to base metal heat damage as a result of abusive grinding of the chrome plate that likely occurred during the last overhaul”. On 03.03.2017, M/s Jet Airways Boeing 737-900, VT-JGD while operating a scheduled domestic passenger flight 9W-354 from Delhi to Mumbai with 120 passengers and 8 crew was involved in an accident at Chhatrapati Shivaji International (CSI) Airport, Mumbai. The aircraft landed safely on runway 27 at 16:22 UTC and was about to vacate the runway via taxiway N9 when the right main landing gear collapsed. There were no injuries to any person onboard the aircraft. The aircraft sustained substantial damage. Before the accident flight on 03.03.2017, the aircraft had successfully operated 04 flights (Delhi- Mumbai, Mumbai-Delhi, Delhi-Mumbai and Mumbai-Delhi). The accident flight (Delhi- Mumbai) was the 05th flight of the day. The flight Delhi- Mumbai chocks off at 1415 UTC and aircraft took off at 1428 UTC from IGI Airport, Delhi. The flight was uneventful till landing at Mumbai. The landing was carried out by co-pilot and PIC was carrying out Supervised Line Flying (SLF). Both the crew was cleared by M/s Jet Airways to carry out SLF duties. During landing flare, aircraft floated a little and the touchdown was normal. The aircraft landed with the “G” load of 1.44. After 16 seconds from touch down during landing roll, at around 58 Kts, there was right roll of 4.57° and the aircraft started veering to the right with a noise which felt like a tire burst to the cockpit crew. To maintain directional control first officer moved the tiller. The aircraft vacated by N9 taxiway and after vacation the aircraft stopped on its own on the taxiway with the tail of the aircraft not fully clear of runway 27. The taxiway N 9 is about 2600 meters/8550 feet down the runway 27. Flaps were moved to 40, in case if the situation warranted an evacuation. Thereafter, PIC contacted to dispatch / maintrol of Jet Airways on VHF 2 and the F/O was monitoring VHF 1. Sequentially, APU was started and Engine No. 2 was shut down and later No. 1 engine was also shut down. PIC advised the cabin crew not to DISARM the doors until advised. As per ATC, sparks were observed from Right side landing gear when aircraft was moving on Runway 27 between Taxiway N 7 and N 8. The same was informed to Crew, Fire Station and Apron control. Also, ATC pressed the crash bell and immediately fire tenders preceded to the crash site. Fire Tenders observed that the Aircraft had bogged down on Taxiway N-9. There was hydraulic leakage and starboard side engine had almost touched the ground. There was no sign fire or smoke observed on accident aircraft, same was informed to the ATC. Fire tenders carried out foam carpeting to mitigate the risk due to spillage. On arrival of passenger stairs, passengers were safely disembarked through the L1 door and no emergency evacuation was carried. Runway 09/27 was closed for flight operations while the aircraft was being removed, all other air traffic used runway 14/32. The recovery work was completed by 0530 UTC on 04-03-2016 and the aircraft was towed to hanger. The aircraft sustained substantial damages. During landing roll, the RH landing gear collapsed and aircraft was resting on its nose and left Main Landing Gear (MLG) and right engine pod. Following main damages occurred to the aircraft. a) RH MLG partially separated from Airframe. b) Both RH MLG doors and attachment found bend and cracked. c) Aft end of RH MLG punctured the composite panel above the wing surface. d) Hanger link mount dislocated and assembly found adrift. e) RH MLG beam scrapped & gouged along forward upper & lower edges at 03 locations. f) RH MLG beam Aft Trunnion bearing race assembly, Pin assembly, cross bolt damaged and trunnion pin sheared. g) All RH upper fixed trailing edge panels attachment rods& brackets bent and torn. h) RH lower fixed trailing edge panel, attachment rods & bracket No. 115A27110 damaged. i) RH MLG beam attachment fitting scratched on lower end. j) RH inboard flap track #5 transmission unit and attachment fitting damaged. k) RH outboard MLG beam support fitting and idler link support assembly damaged. l) RH inboard Trailing edge flap torque tube and fairleads bent and damaged. m) RH engine inlet cowls, fan cowls scrapped along the lower surface. n) RH engine thrust reversers severely scrapped along lower surface and latches found damaged. o) Hydraulic fluid spillage occurred on Taxiway N9 due to damage to RH MLG. The main purpose of Trunnion Pin is to support Landing Gear & pivot. The Landing Gear trunnion pin is made of high strength alloy steel material 4340M manufactured by Magellan Aerospace New York Inc, USA. The heat treatment is 275-300 KSI per BAC5617 and material specification: BMS7-26. The outside diameter finish is F-15.34 chromium plate in accordance with BAC 5709, class 3.F-19.451 apply wipe-on primer, BMS 10-79, type iii, in accordance with BAC 5882 whereas Inside Diameter finish is F-15.01 cadmium-titanium alloy plate and apply chromate treatment in accordance with BAC5804. F-19.66 apply two coats of BMS 10-79 type iii primer in accordance with BAC 5882. Landing Gear has overhaul life of 21000 Flight Cycle/ 10 year and life limit of Trunnion Pin is 75000 Flight Cycle. Greasing method of landing Gear is through Grease Gun. Landing Gear lubrication interval is 560 cyc or 90 days. RH Trunnion Pin Details (as on 03.03.2016). 1. The pin was first installed on VT-JGC on 06-05-2003. 2. Pin was overhauled on 11-07-2013 and was again installed on VT-JGD on 06-08-2013.  Aircraft completed 04 sectors on the date of accident i.e. Delhi- Mumbai (02) and Mumbai-Delhi (02). The accident flight was 05 flight of the day i.e. Delhi- Mumbai.  Last Extended Transit inspection done on 02-03-2016 at Delhi.  Last 30 days inspection and Layover done on 02-03-2016 at Delhi.  Last A4 check done on 31-01-2016 at Mumbai.  Last C check done on 18-07-2015 at Mumbai.  All 03 Landing Gear Servicing were carried out on 02-07-2015.  Landing gears (LH, RH, and NOSE) lubrication carried out on 17-02-2016 at Delhi.  Aft & Forward LH & RH MLG Trunnion Pin assemblies lubrication carried out on 10-02-2016 at Ahmedabad.  Trunnion Pin Inspection of VT-JGD post Khajuraho Accident were carried out on 15-04-2015 at Delhi. Validity of Certificate of Airworthiness - Unlimited. During the first flight of the day on 03-03-2016, Pilot raised following snags after landing at Mumbai. 1. A/C seems to shimmy at certain taxi speed. 2. On Ldg sel A/c oscillation observed in cruise. 3. Yaw damper lt. came on approach and got reset. Maintenance were carried by AME at Mumbai on 03-03-2016 after the first flight. a) As per work order W/O 2646330:- Nose L/G insp. No abnormalities found. No leak and Tyre condition good. Nose wheel TPG C/N observed 205 psi which is normal. A/c normalized. Crew to report further. b) As per work order W/O 2775166:- for snag 2 & 3 MEL 22-3-2 applied. Same invoked. Crew briefed. Cockpit placarded. DDPG complied. MEL is CAT ’C’. No defueling was carried out at Mumbai after the accident on 03-03-2016. The DFDR readout was analyzed and following are the salient findings.  Accident flight VIDP-VABB lasts from 14:17:58 to 17:26:41UTC.  LDG SEL (Landing Gear) down at 16:19:27 UTC.  At 1000 ft AFE (16:20:19 UTC), Flaps are 30, CAS is 151 and ROD is 788. Both A/P is at CMD position and A/T are active.  At 500 ft AFE (16:20:57 UTC), Flaps are 30, CAS is 152, ROD is 893, A/P is at FD and A/T is active.  At touch down (16:21:47 UTC), Flaps are 30, CAS is 141, ROD is 30, Vert. G is 1.44, Pitch 2.11 and Roll is -1.05, Heading 271.  At 16:22:03, CAS is 58 knots and aircraft roll changes from -0.35 to 4.57, Heading 270.  Hydraulic Qty., System A starts reducing and becomes 0 at 16:23:49 UTC.  Hydraulic Oil Pressure Sys A, starts reducing drastically from 16:24:39 UTC.  Ground Spoiler/SPD BRK 1 was activated from 16:21:46 to 16:22:33 UTC.  Ground Spoiler/SPD BRK 2 was activated from 16:21:45 to 16:22:32 UTC.  ENG REV 1 & 2 deployed at 16:21:51 and stowed back at 16:22:18 UTC.  At 16:22:47 UTC, the aircraft speed reduced to 0, Heading 296.  CUT OFF 2 (Engine 2) at 16:27:03 and CUT OFF 1 (Engine 1) at 16:28:35 UTC.  WARN-MASTER (Master Caution Warning) from 16:22:16 to 16:22:23 and 16:25:12 to 16:25:46 UTC.  There was no Fire Warning.  The DFDR stop recording at 16:28:38 UTC. The failed RH aft landing Gear Trunnion pin of VT-JGD was examined in DGCA and NTSB, USA. Along with RH, LH aft landing Gear Trunnion pin of VT-JGD, all the other 08 pins overhauled by M/s ST Aerospace Oslo were also sent to NTSB, USA for detailed examination. Failure Analysis Lab, DGCA carried out metrological analysis of failed trunnion pin of VT-JGD. The lab report reveals that the “the trunnion pin has failed in fatigue originating from a pre-existing crack”.  The Pin at S. No. 2 installed on VT-JGD broke during landing on 03-03-2016.  The Nose L/G Trunnion Pin (LH & RH) of VT-JGM couldn’t be sent to NTSB as the aircraft was deregistered . 1. Fracture initiation was due to base metal heat damage as a result of abusive grinding of the chrome plate that likely occurred during the last overhaul. 2. The fracture originated in an area of un-tempered martinsite (UTM) on the outer diameter of the trunnion pin. The crack originated from intergranular separation, a result of hydrogen embrittlement during cadmium plate processing. The crack propagated by Trans-granular fatigue mode with ductile separation at final fracture. Multiple cracks were found near the fracture origin. 3. The material met the material specification heat treat requirements. M/s Jet Airways B 737-800 aircraft VT-JGA involved in a similar at Khajuraho while operating a schedule flight 9W- 2423 from Varanasi to Khajuraho. While landing, left main landing gear collapsed due to failure of Aft Main Landing Gear Trunnion Pin. After the accident the damaged LH MLG Aft Trunnion Pin and RH MLG Trunnion Pin were sent to NTSB for failure analysis. Based on Preliminary report from NTSB, M/s Jet Airways informed that only two set of Landing Gears installed on (VT-JGA, VT-JGC) were overhauled by ST Aerospace Oslo. As a precautionary measure, after the accident of VTJGA, on 20-08-2015, LH & RH aft trunnion pin of VT-JGC were removed from the aircraft. After the accident of VT-JGD, M/s Jet Airways informed that the Landing Gear Trunnion Pin installed on VT- JGD was also overhauled by M/s ST Aerospace, Oslo. On 14-04-2016, M/s Jet Airways informed that 03 set of landing Gear installed on (VT-JGA, VT-JGC, VT-JGD) were overhauled by ST Aerospace, Oslo along with 02 set of Nose landing Gear Trunnion Pin installed on (VT-JGM and VT-JNL). After the accident of VT-JGD, M/s Boeing advised Jet Airways to remove all the trunnion pins (Aft, front & Nose landing Gear) overhauled from ST Aerospace, Oslo and Send to NTSB for failure analysis. However, the Landing Gears overhauled by ST Aerospace were not removed. A hard landing typically occurs when the sink rate is high and the aircraft touches down on the runway with a thud instead of doing a smooth transition onto ground. An indication of a hard landing on the main landing gear is a peak recorded vertical acceleration that exceeds 2.1 G (incremental 1.1 G). As per data given by Jet Airways, VT- JGD was involved in 03 incidents of landing above 2.1 G after overhauled trunnion pins were installed (6th August 2013 ). In the above mentioned instances, all relevant AMM tasks were carried out. 1.18.6 Overhaul of Landing Gear by M/s ST Aerospace Solutions (Europe) A/S, Oslo. The installed Main Landing Gears Aft Trunnion Pins of VT-JGD were overhauled by M/s ST Aerospace Solutions (Europe) A/S, Oslo, Norway. The LH landing Gear Trunnion Pin Sl. No. 90827-0891 and RH landing Gear Trunnion Pin Sl. No. E2430 was overhauled on 11-07- 2013. M/s ST Aerospace, Oslo was approved by Danish Transport Authority vide DK.145.0092 & FAA vide SCGZ360Y valid upto 31st October 2013. However, the overhaul facility was not approved under CAR 145 by DGCA, India. The Landing Gear Pin was installed along with Landing Gear on 06-08-2013 by Jet Airways. The overhaul process sheets of Trunnion Pin were checked and the appropriate procedures as outlined for the landing gear overhaul were carried out. Both the left and right pins were apparently processed at the same time as seen from the dates of overhaul. Boeing B 737-900 aircraft VT-JGD (MSN 33740) was manufactured in year July 2003. On the day of accident, the aircraft had logged 36560:08 airframe hours and 21426 cycles and was holding a valid certificate of airworthiness and flight release prior to flight. The Jet Airways was having valid Air Operator Permit (AOP) & CAR-145 Approval. The aircraft and engines were being maintained under continuous maintenance as per approved maintenance program consisting of calendar period based maintenance and flying hours /cycles based maintenance. The last Check ‘C’ Inspection was carried out on 18-07-2015 at Mumbai. AFT & Forward LH & RH Main Landing Gear (MLG) Trunnion Pin Inspection was carried out 10- 02-2016 at Ahmedabad. The load and trim sheet was prepared before flight and c.g. of the aircraft was within the operating limits. There was no sang reported on the aircraft prior to the accident flight. After the present accident, all the Trunnion Pins overhauled by M/s ST Aerospace were removed from Jet Airways aircrafts and send to NTSB for failure analysis. However, all the Landing Gears overhauled by ST Aerospace were not removed. Though, the aircraft was serviceable but the Trunnion Pin overhauled by the ST Aerospace were not removed after earlier accident due to error by Logistic Department in retrieving data from AMOS. Weather is not a contributory factor to the accident. 2.3 OVERHAUL OF TRUNNION PIN BY M/S ST AEROSPACE SOLUTIONS (EUROPE) A/S, OSLO, NORWAY AND FAILURE INVESTIGATION. The LH landing Gear Trunnion Pin Sl. No. 90827-0891 and RH landing Gear Trunnion Pin Sl. No. E2430 of VT-JGD was overhauled on 11/07/2013 and issued with EASA Form -1. M/s ST Aerospace Solutions (Europe) A/S, Oslo was approved by FAA and EASA but not approved by DGCA India, under any regulation. Both the left and right pins were apparently processed at the same time. Both LH & RH aft trunnion pins of VT-JGA were overhauled on 27-03- 2012. Both LH & RH aft trunnion pins of VT-JGD were overhauled on 11-07-2013. LH forward main landing gear trunnion pin of VT-JGC was overhauled on 25-09- 2013. Fracture initiation of RH MLG Trunnion Pin of VT-JGD was due to base metal heat damage as a result of abusive grinding of the chrome plate that likely occurred during the last overhaul. The fracture originated in an area of un-tempered martinsite (UTM) on the outer diameter of the trunnion pin. The crack originated from intergranular separation, a result of hydrogen embrittlement during cadmium plate processing. The crack propagated by Transgranular fatigue mode with ductile separation at final fracture. Multiple cracks were found near the fracture origin. The LH MLG Trunnion Pin of VT-JGA had also failed in fatigue originating from black strip which was probably a pre-existing crack. “Chicken wire” cracking was observed over the entire chrome surface of the pin. The fractured aft trunnion pin contained an intergranular crack on the fracture face measuring 0.018 inch from the outer diameter (OD). Fatigue cracking was observed emanating 0.22 inch from the intergranular crack. Fracture initiation occurred by heat induced cracking which propagated during processing by a hydrogen embrittlement mechanism. Once in service, fatigue cracking initiated of the existing crack until final fracture by ductile separation. M/s Jet Airways B-737-900 aircraft VT-JGD flight 9W- 354 (Delhi -Mumbai) was involved in an accident at Mumbai Airport on 03-03-2016 at 1622 UTC. The landing was carried out by Co-pilot & PIC was carrying out SLF. The aircraft landed safely on Runway 27 and during landing roll, 16 seconds after touchdown, at speed 58 knots Right main landing gear aft trunnion pin broke and Right Main Landing Gear collapsed. The aircraft started deviating to the right of center line. Pilot tried to vacate runway via taxiway N9 using tiller but aircraft stopped on taxiway. There was damage to the RH landing gear and aircraft was resting on RH engine, Nose & LH landing Gear. Hydraulic fluid spillage occurred due to damage to RH main landing gear. Maximum G load recorded during landing was 1.44 G. ATC observed sparks between Taxiway N 7 and N 8 when engine cowl was rubbing runway and informed Fire Station and Apron control. The CFT reached the aircraft and sprayed the foam fire Extinguisher on the No. 2 Engine & RH Landing gear area on spilled Hydraulic Fluid to prevent fire. The passengers disembarked from L1 door using passenger stairs. After the accident, the failure investigation of Trunnion Pin was carried out at DGCA & NTSB, USA. The report reveals that that the RH trunnion pin failed due to base metal heat damage as a result of abusive grinding of the chrome plate that likely occurred during the last overhaul. The fracture originated in an area of un-tempered martinsite (UTM) on the outer diameter of the trunnion pin. The crack originated from intergranular separation, a result of hydrogen embrittlement during cadmium plate processing. The crack propagated by Transgranular fatigue mode with ductile separation at final fracture. Multiple cracks were found near the fracture origin. 1) The Certificate of Airworthiness and the Certificate of Registration of the aircraft was current/valid on the date of accident. 2) The certificate of flight release was valid on the day of accident. 3) Both the pilots were appropriately qualified to operate the flight. 4) The landing was carried out by co-pilot and PIC was carrying out Supervised Line Flying (SLF). 5) The aircraft landed safely on Runway 27 at 1622 UTC and during landing roll, 16 seconds after touchdown, at speed 58 knots Right main landing gear aft trunnion pin broke and Right Main Landing Gear collapsed. Maximum G load recorded during landing was 1.44 G.
6) PIC tried to vacate runway via taxiway N9 using tiller but aircraft stopped on taxiway. There was damage to the RH landing gear and aircraft was resting on RH engine, Nose & LH landing Gear. Hydraulic fluid spillage occurred due to damage to RH main landing gear. 7) ATC observed sparks between Taxiway N 7 and N 8 when engine cowl was rubbing runway and informed Fire Station and Apron control. The CFT reached the accident site at 1627 UTC and sprayed the foam fire Extinguisher on the No. 2 Engine & RH Landing gear area on spilled Hydraulic Fluid to prevent fire. 8) All passengers disembarked from L1 door using passenger stairs at 1702 UTC. 9) After the accident, the failure investigation of Trunnion Pin was carried out at DGCA & NTSB, USA. The report reveals that that the RH trunnion pin failed due to base metal heat damage as a result of abusive grinding of the chrome plate that likely occurred during the last overhaul. 10) Ten Trunnion pins overhauled by M/s ST Aerospace were sent to NTSB for failure investigation. Out of (10) ten pins, 02 others pins shows similar damages. Earlier two Aft Trunnion pins of VT-JGA, LH (broken) and RH overhauled by M/s ST Aerospace shows similar type of damages. Aerospace as a precautionary measure. 12) However after the accident of VT-JGD, M/s Jet Airways informed that the landing Gear of VT-JGD came under exchange order and the staff while extracting the data from AMOS inadvertently extracted incomplete data. 13) The landing gear did not come under the exchange as it was earlier installed on VT-JGC and sent by Jet Airways for Overhaul to M/s ST Aerospace. 14) M/s ST Aerospace Solutions (Europe) A/S, Oslo was approved by FAA and EASA but was not approved under CAR -145 by DGCA, India. 15) DGCA CAR M regulations doesn’t restrict overhaul of Landing Gear at CAR 145 approved organization. i. In view lapse of AMOS entry, Jet Airways may review the AMOS system for corrective action. i. DGCA may review the CAR M regulations regarding maintenance / overhaul of aircraft and its components thereof at Foreign Maintenance & Repair Organizations (MRO) not approved by DGCA. The Indian DGCA published their final report on 26 Feb 2018 which can be read here.